How do you survive a long Montana winter if you don’t ski? Big Sky Country boasts a lot of best place to be titles. Big Sky boasts the Best fishing, hunting, hiking, camping, open spaces, boating, and yes, skiing. I do it all except skiing. Skiing just doesn’t give me a thrill. Maybe it’s because of all the crutches, casts, and avalanches. If I am going to get injured, it has to be for something worth the risk to me. Going fast and out of control through a herd of other folks going fast and out of control reminds me too much of big city traffic. Now, cross country skiing may be more fun, but I need a destination or purpose. Just “swooshing” around on a path to nowhere special isn’t for everyone. Snowmobiling is another choice but they stink, are loud, and speed is another risk….oh, and did I mention avalanches? Sure, exercise is important. Long winters with long periods of darkness tend to make “morlocks” and “beefmasters” out of us all. Compound this with the feeding frenzy associated with the holidays we celebrate in November and December…burp…oh excuse me! 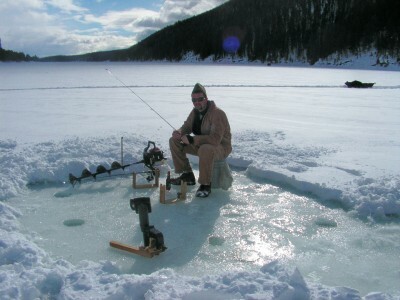 Now Ice Fishing is a great idea. Montana does boast some wonderful “Hard Water” hot spots. Ice is a poor man’s fishing boat. There is nowhere you can’t go on ice. Ice fishermen are friendly and fresh fish in winter are real tasty! No, we need to be productive during our “winter cave time.” Some folks get busy and become reproductive – the number of summer and fall births are proof of this phenomena. Speaking of “proof”, there is also the tendency to “winter” at local bars and casinos. Drinking, gambling, and socializing helps to pass the time, but please do so responsibly. With the emigration of snow coaches full of skiiers, lots of folks “get out of Dodge” for warmer climates. A warm sunny beach with clear blue water is sure appealing when the local temperature hovers at a balmy -20 degrees.